We will be joining a brand new Blue Knights & Little Flowers group this Fall and in talking to some moms who expressed a concern for their little ones outgrowing the sash or vest with all of the lovely little patches (thereby requiring them to be cut off and sewn again), someone suggested that they could be sewn onto a tote bag (or backpack for the boys) instead. I think that's a great idea and would be something that they would have more opportunity to use in the "real world". That in combination with the fact that my kids usually carry their library books back and forth in plastic grocery store bags and my desire to "use it if you got it" made this simple tote a fun project for today. Again, all of the materials came from my craft closet. I loosely followed the instructions shown here regarding how to make your own straps and cornering off the bottom. 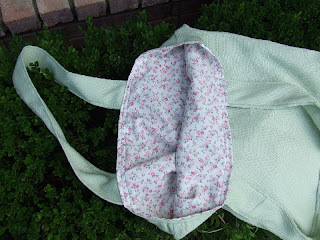 I decided to line it since the cotton was pretty thin and opted to sew the handles just at the top, not around the bottom. It's pretty plain, but it is just supposed to be functional. 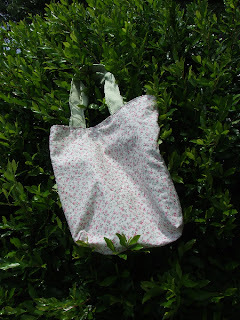 And should Husband worry about being seen carrying a pink flowered bag on Library Night, never fear, dear... it's reversible.